On May 28, 2013, in Raamsteeg2, Leiden, The Netherlands, six prominent Dutch scientists will present their field of research by giving a complete technical description, in Dutch, in twenty-four (24) seconds, followed by a clear summary that anyone can understand, in seven (7) Dutch words. The best of these 24/7 speakers will be invited to present a 24/7 Lecture at the Nederlandse Ig Nobel Night, September 14th, 2013. The time and word limits will be enforced by referee Maarten Keulemans, science editor of De Volkskrant. This form of communication — the 24/7 Lectures — was invented at the Ig Nobel Prize ceremony, and has long been a featured part of that annual event. 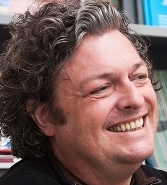 At the Leiden event, our European Bureau Chief (and winner of the 2003 Ig Nobel Prize for biology) Kees Moeliker will explain the history of the 24/7 Lectures and of the Ig Nobel Prizes. Where & when: Raamsteeg2, Raamsteeg 2, 2311 PL Leiden, the Netherlands; May 28, 2013, Tuesday, 8:00 pm (doors and bar open 7:30 pm). Posted by Marc Abrahams on Thursday, May 16th, 2013 at 10:49 am under Arts and Science.